Don’t miss the last Summer Nights 2018 on August 25th! 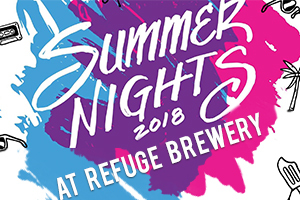 Get ready for a lively evening at the Refuge Brewery in Temecula when they open the back patio to host an awesome live band, food trucks with delectable cuisine and kegs of specialty beers. Tickets include a collectable pint glass and a pour of the featured beer. Enjoy all beers after the first glass at the discounted price of $5. Guests must be 21+, see you there!